Which of the following is the most appropriate next step in managing this condition? Intussusception first do ultrasound to confirm. 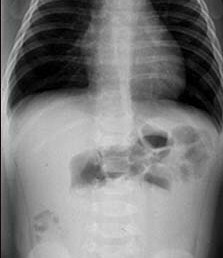 its intussusception do barium enema…..it will be t/t plus diagnosis…. C……..For any kind of small bowel obstruction, we have to do the same. Children whose symptoms persist longer than 24 hours, or have signs of peritonitis, should not be considered candidates for enema reduction. Stabilize these children and immediately transport them to the operating room because untreated intussusception is almost always fatal. The recurrence rate is higher after radiographic than after surgical reduction. Surgery is also indicated for patients whose intussusception cannot be reduced after 2 enema attempts. Gastrograffin enema is both diagnostic and therapeutic . C-surgery because patient has free intraperitoneal gas indicating perforation. The child has likely intussusception. There is no fever, no abdominal tenderness and bowel sound is present – it shows the intestine is not impending gangrene and he does not need emergency surgery right now. Ba enema is both diagnostic and therapeutic for intussuception. (B)the clinical picture is typical for intussception(intermttent colics). Gastrografin ia diagnostic and may reduce the intussception.